The other part of the job! I’m not only the Ranger but also the secretary for the trust. I seem to have spent a fair bit of time this week in the office trying to be creative with the layout of the Hurtwood Friends’ Newsletter. It’s finished now and at the printers, so should be arriving on Hurtwood Friends doormats by the weekend. Sunday was a great day for the Green and Clean event with over 50 children attending, and a good pick-up load of rubbish collected plus another load of sacks that were left in the car parks. A big “Thank You” to everyone who turned out. About two tons of wood was stolen from Walking Bottom car park this week plus a galvanised metal strip from the back of the wooden gate (why anyone should want that I’ll never know!). If you see anything suspicious please call the police and then me. Firewood is now a valuable commodity with rising heating fuel prices, please be on the look out. Will Wallace arrived with his saw mill this week to plank up the timber for the cladding on the side of the new tractor shed. Once the mill is set up it doesn’t take long to produce a reasonable stack of timber, especially as we had the help of a volunteer, Simon Chaffe, who I’d like to thank for his hard work. One extra pair of hands is a great help when it comes to lugging timber around. 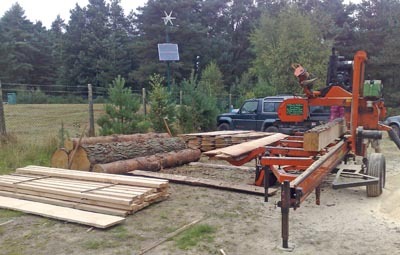 The timber we used was Pine cut from the estate. I think I can say our carbon footprint for building this shed is going to be considerably less than any other similar project. 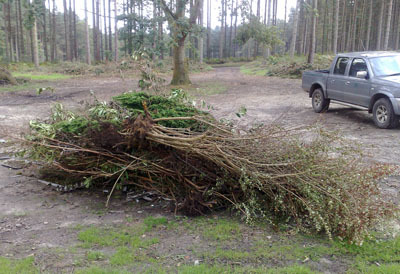 The new tractor really proved its usefulness this afternoon, this lot of fly tip in the Radnor Road carpark only took 6 minutes to load onto the trailer as opposed to about an hour doing it by hand, not to mention some of the roots were too heavy for one person to lift. The other alternative is to burn it up in situ, but obviously having a bonfire in a carpark can bring a host of other problems too. 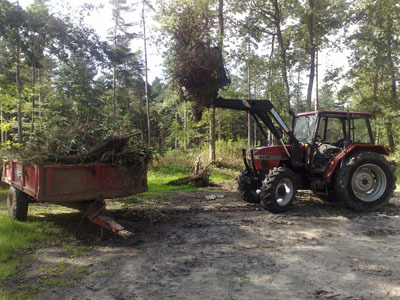 I used the tractor with the bucket for the first time yesterday, scooping up the waste sandy spoil from the old quarry. 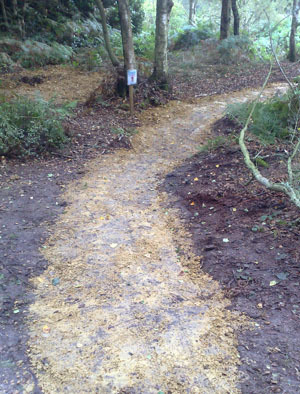 This makes ideal sand for the bike trails when it’s needed to raise the levels slightly to help with water run off and prevent trail creep. Here are before and after pictures. 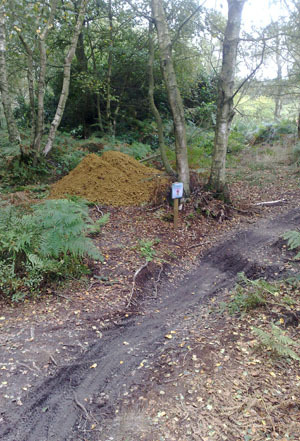 Well, we had some torrential rain over the weekend, luckily we had most of the gulleys cleared by Saturday lunchtime. Clearing gulleys is a necessary job and to be honest is best done when it’s raining, that way you can see where the water is/is’nt going and make alterations to the ditches. Despite our efforts by Sunday morning there still seem to be a large part of the hills on the roads in the villages. 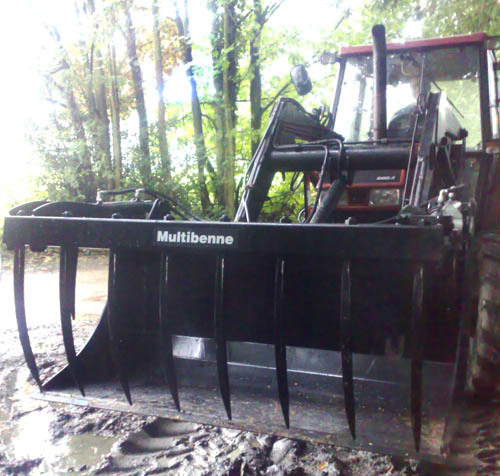 I sent Jim down to Bath to pick up the new Grab bucket for the tractor. All arrived back safely, only to find it didn’t quite fit! So I’ve been out today with the angle grinder and a sledge hammer, fits a treat now. When it comes to mechanics, I tend to adopt the theory “if in doubt, give it a clout”, generally works for me. I did learn today never to undo hydraulic hoses when they’re under pressure, covered myself head to foot in oil, lovely! After getting cleaned up and ready to try out the bucket, I discovered one of the two pins that holds the front section of the loader in place was broken. I shudder to think what might of happened if I hadn’t seen it. Back to Wiltshires in Dunsfold. It’s a two man job to get them replaced so I’ll do it tomorrow with Lewis.